I remember the time my father taught me chess. On a Sunday afternoon, I sat cross legged at the center table in the drawing room, silently watching him put the pieces in place. “This is the queen, and this is the king”, he said, holding up the pieces. My eyes widened. I reached for them, running my fingers gently along the piece, examining it closely as he set up the board. He went on to explain the rules to me. “The aim is to protect the king at all costs” he said, showing me how the different pieces moved across the chessboard. It was the most beautiful game I’d seen. I stopped listening. All I saw was a story. A story of two kingdoms, equal in strength, competing for supremacy. I saw a battle begin before my eyes. The pieces charged towards each other, falling by the dozen as the game unfolded before me. Pawns were mercilessly sacrificed to save the knights and knights grabbed the opportunity to face certain death for their king. The king stayed quiet, almost complacent, surrounded securely by his fortress of devoted subjects while those on the battlefield continued to fall. Their bodies lay scattered across the table. The fallen whites and blacks tossed carelessly aside as the war waged on. I looked sympathetically at the black Rook, as he lay still on the corner of the table. Overthrown by a mere pawn, he thought, for shame. He hoped his partner would avenge the insult. He lay still, struggling to stay awake, his eyes glued to the battle until the other Rook, with one swift move brought the white Pawn down. The Pawn fell slowly, hitting the ground as the blacks broke into a roaring applause that resounded through the battlefield. The Rook looked at him as he twitched in pain, the piercing wounds in his own body disappearing, if only for a minute. He breathed deep and finally closed his eyes. Back in the fortress, I saw a woman married to a man who didn’t deserve her. A smart, able, powerful woman who had sworn to protect her husband. A husband who was lazy, unskilled and unfit to be a warrior. He stayed in the fortress, anxiously watching the battle, as pieces fought and fell. He shifted nervously, taking a step any direction he pleased as the enemy got closer. The Queen stood by his side, getting ready for battle, as the fortress shrunk with every minute. She wondered how different it would’ve been if she was the ruler. A trained warrior, she had mastered every move in the book. She could move in any direction, for any length with unmatched skill. Her heart breaking as she watched her soldiers die. She ached to step onto the battlefield, wondering how many lives she could have saved if she wasn’t sworn to the king. Yet, like any gracious woman, she knew her place. She would stand beside her husband until it was time to sacrifice herself for him. There were few pieces left on the battlefield. The queen bravely took her place in front of her shivering husband. He stood still behind her, as the enemy got closer. The queen lunged forward, striking the white bishop that seemed to be getting too close. The King heaved a sigh of relief. Until, “Checkmate” the voice echoing through the battle field. The Queen turned around in horror as the white Rook and knight laughed menacingly through their yellowing teeth. 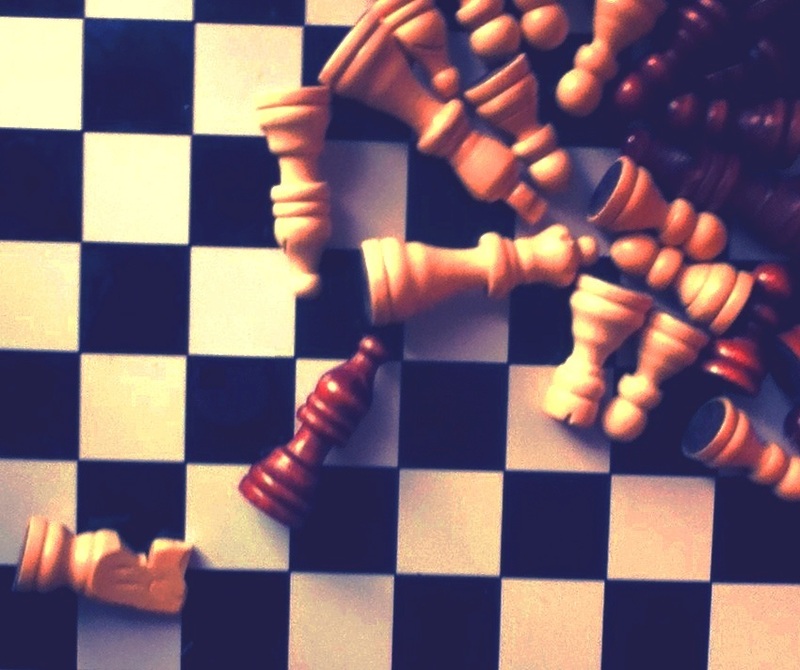 The king looked at her helplessly as the rook toppled him over, letting him fall off the board and onto the table. The white King seemed pleased. Looking around at the lands he had conquered. He looked dully at the bodies that lay at his feet. Knights, Pawns, his Queen. He scanned the barren chessboard, his eyes travelling to the fallen king. It seemed like he was lost in deep, peaceful sleep. A pang of jealousy stung him as he stood alone on the cold, lonely battlefield, suddenly craving the luxury of everlasting sleep. He looked around silently, unsure who had really won the war. “Tutu, do you understand?” my father asked me. I broke out of my trance and blinked softly. “Yes”. “Good. Enough for today.” He said, picking up the pieces. I helped him, picking up the fallen pawns, knights and kings to drop them into the box. I marveled at how they looked so peaceful. The different pieces, tangled up in each other, oblivious to the war, the bloodshed, the loss. Until the same time, next Sunday. wow!! awesome imagination..i just love it. marvellous writing, thanks for sharing this one. Never seen such depiction of a game. Made me emotional ,as i am a chess player but never thot about it the way you described …..